16160624 | Following a face lift, Hayle's outdoor swimming pool is set to re-open this weekend, are you tempted to go for a dip? The future of Hayle Swimming Pool is in our hands, since Cornwall Council ceased funding. Hayle Town Council owns and manages it helped by volunteers. Free Tuesday Tickets are available to TR27 postal code residents, upon proof of address. Loyalty cards are also available, ask the pool staff for more details. 160809 | HAYLE SWIMMING POOL is up to 24 deg C already! Submitted by Graham Coad via... on Wed, 10/08/2016 - 13:28. HAYLE SWIMMING POOL is up to 24 deg C already after the new solar heating covers have been fitted!! OUR POOL IS HEATED AT LAST! Submitted by via facebook Ha... on Thu, 04/08/2016 - 13:11. Hayle Town Clerk confirms THE NEW SWIMMING POOL SOLAR HEATING COVERS, benches and associated equipment was all delivered yesterday and work commenced on the installation this morning! The contractors are trying to work around our normal operating/opening hours but today (Wednesday 3rd Aug) asked that we didn't open the pool until 12 noon. Notices were put at the pool and on the Swimming Pool Facebook page. Hopefully,from Thursday normal opening hours will be resumed. It is hoped that the the covers will be fully installed by the close of play on Friday, (potentially sooner), and the water should start to be warmed in time to make a difference for the weekend! Submitted by via Hayle Town ... on Thu, 04/08/2016 - 13:06. 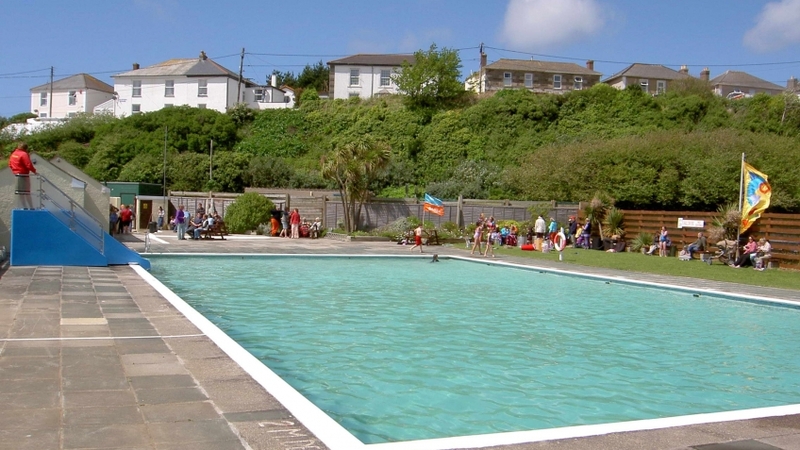 Hayle’s outdoor pool is set to open Saturday 25 June, with the usual first day free admission, following something of a makeover during the spring. The pool has been drained and power washed with walls painted aqua blue before being refilled with fresh water. This process has given the appearance of the pool a considerable lift and has been supplemented by the surrounds which are now being cared for by the council’s gardening staff with the help of volunteers. Following on from the tiling and decoration of the ladies changing accommodation last year the gents facility has been subjected to a similar upgrade prior to the forthcoming season. Hayle Town Council, which operates the pool, is again greatly indebted to the Friends of the Pool who, although small in number have worked tirelessly on the decoration of the buildings and picnic tables adding further to the fresh look of the pool and its environs. Unfortunately there has been a delay in the delivery and installation of the solar covers which are being fitted to improve the water temperature but they have been ordered and it is hoped to have them installed during the season if there is not too much of an interruption to the use of the pool. The Council is also indebted to Marks and Spencers and Western Power for the grants received through their community energy funds and, of course, to everyone who voted to support improvements to the pool. On a more positive note, the Council is investigating the cost of installing solar panels and a heat exchange mechanism to further improve the water temperature and although this is of course cost dependent it is very much hoped that it can be achieved from funds held by the Council.